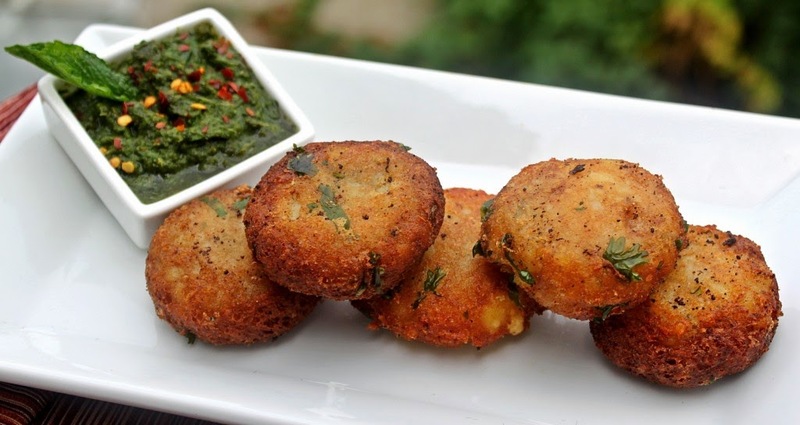 Aloo tikki is a most popular north Indian dish.You can make this crispy ,spicy aloo tikki in your home.You can serve it as a snacks. Aloo means a potato and tikki means a small cutlet or croquette.Aloo tikki is basically mashed potato mixed with some ingridents deep-fried in oil . You can serve it with dahi, green chutney, or tomato sauce. Wash and put wet potatoes in a micro safe streamer bowl.Microwave for 5 minutes and cool it. Peel and mesh potatoes using mesher or hands. Add 1 tbsp oil, peas,salt, cumin seeds, ginger, chopped green chillies, ginger, coriander,garam masala, chopped onion,red chilli powder, balack pepper powder and mix it properly. Now, make tikkies of 3″ diameter. Brush the non stick tawa of the microwave with some oil. Brush the tikkies with oil. Place the tawa on high rack.Grill it for 4 minutes. Turn side and grill for 5 minutes. Now, tikkies are ready to serve. Wash and put potatoes in a cooker and also add some water ans boil a potatoes. Add all ingredients except oil and mix it properly. Now, make tikkies of 3″diameter. Now, put a tikkies in pan and deep fry it on simmer flame. Put these fried tikkies into a bowl and serve hot. Before serving sprinkle a chaat masala on it and serve these hot spicy tikkies with green chilli sauce or tomato sauce.